Every woman who has ever fantasized about driving past her exit on the highway instead of going home to make dinner, and every woman who has ever dreamed of boarding a train to a place where no one needs constant attention--meet Maribeth Klein. A harried working mother who’s so busy taking care of her husband and twins, she doesn’t even realize she’s had a heart attack. With bighearted characters--husbands, wives, friends, and lovers--who stumble and trip, grow and forgive, Leave Me is about facing the fears we’re all running from. Gayle Forman is a dazzling observer of human nature. She has written an irresistible novel that confronts the ambivalence of modern motherhood head on and asks, what happens when a grown woman runs away from home? Gayle Forman is a bestselling, award-winning author of young adult novels. 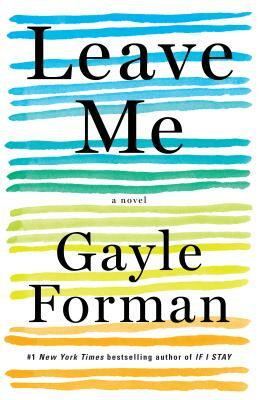 Leave Me is her first novel for adults. Her novel If I Stay won the 2009 NAIBA Book of the Year Award and was a 2010 Indie Choice Honor Award winner. The film adaptation of If I Stay was released in 2014. Forman is also a journalist whose articles have appeared in numerous publications, including Seventeen, Cosmopolitan, and Elle. She has visited more than forty countries and wrote a nonfiction book about her travels titled You Can’t Get There from Here: A Year on the Fringes of a Shrinking World. Forman lives in Brooklyn, New York, with her husband and two daughters. "Forman is a gifted storyteller whose characters are flawed and engaging."